Title rivals Martonian United and Telegraph put on a full-blooded, competitive tie appropriate for a top-of-the table clash. Bragging rights were up for grabs in the first of three meetings this year between the teams and the game did not disappoint. Referee Pete Blenkin allowed the players to get stuck in and both teams obliged in kind. Jamie Osbourne and Mike Tate scored for Telegraph, with seasoned campaigner Lee Williamson notching for Martonian. The competitive nature of the game lasted the full 90 minutes, with both teams battling until the end. Jason Ridley kept up his hunt for the top goalscorer trophy, netting four times for league leaders Flamborough 2nds as they roared to an 11-0 home win against Goal Sports Reserves. Liam Price’s hat-trick was reward for his man of the match performance for the villagers, with Jordon Gascoigne adding a brace of goals, along with an effort apiece for Dan Wood and Peter Ellis. In the newly-named Secretaries’ Cup competition, Coachman took on the resurgent Bridlington Sports Club side and met a much better and more organised team than they encountered at the start of the season. Matty Crisp was the provider for Coachman, laying on passes for seasoned campaigner Trev Tindall (2), Joel Rollinson and Jason Coultas to score. Sam Gray scored for Sports. While Crisp took the plaudits for his distribution, both keepers put in a solid shift to keep the scores down, in a game full of attacking prowess. Pocklington Town 4ths took up the second of the semi-final places with a 4-2 win on the CYP 4G at Gypsey Road against Martonian. Sam Parkinson hit a brace, with Alex Pilkington and Matt Hasdell also on target to steer Pocklington past a competitive Martonian side. CYP kindly moved the game onto the artificial surface to guarantee the cup game went ahead following further rain in the days leading up to last weekend’s matches. Mark Lister’s double proved fruitless for the Martonian side. League official Andrew Wilkinson said: “Forecasts suggest that the wintry weather may well cause disruption to this weekend’s fixtures, therefore communication between the clubs and league is vital. “League and cup fixtures have been published. “Players are asked to understand, that due to earlier postponements and re-arranged fixtures, games already played, that teams will not be scheduled with a fixture for every week. Saturday’s fixtures: Flamborough v Martonian United, Martonian FC v GoalSports, Telegraph v Bridlington Sports Club. Wilkinson added: “The Driffield and Bridlington Football League is currently looking for teams to compete in the league next season. 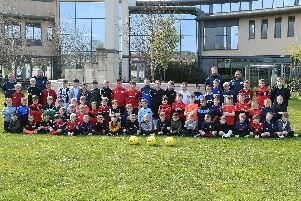 “The league has a focus on providing competitive football for the local area. Further details of how to sign on are available from league officials.